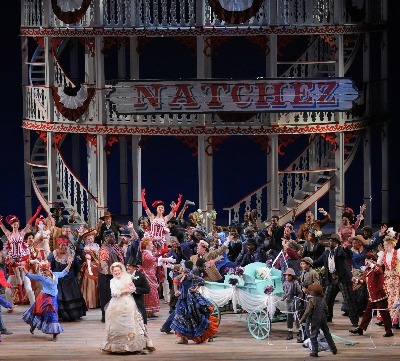 The Lyric Opera of Chicago’s first venture into the American musical, with “Show Boat,” is so complete a triumph, so rewarding both musically and theatrically, that any praise for performances must defer to kudos for the production as a whole. Here are not only the resources but also the standards of a major opera company brought to bear on one of the greatest of American musicals. Between the sympathetic and artful conducting of John DeMain and the affectionate, stage-savvy direction of Francesca Zambello, the stunning sets by Peter J. Davison and the lavish costumes created by Paul Tazewell, the Lyric’s “Show Boat” is indeed a showcase for what the musical can be. While it is vibrantly, wonderfully entertaining, the production also probes deep into the dramatic heart of “Show Boat.” Based on Edna Ferber’s novel of the same title, the 1927 musical – with music by Jerome Kern and lyrics by Oscar Hammerstein II – follows the fortunes of Magnolia Hawks, the stage-struck daughter of a show boat captain, and the handsome gambler Gaylord Ravenal. From their chance meeting on the show boat Cotton Blossom in the 1880s, the story spans some 40 years, tracing the couple’s ill-starred marriage and Magnolia’s successful stage career to a poignant conclusion in the late 1920s. At the same time, “Show Boat” deals openly with racial prejudice on the Mississippi delta and the hard life of black people in the first generations after the Civil War – a time not so far removed from the show’s premiere in 1927, or roughly the same remove as we are today from the Vietnam War. A key, tragic element of the drama is the secret (and at the time illegal) marriage, between two members of the show boat acting company, a white man and a woman of bi-racial parentage. 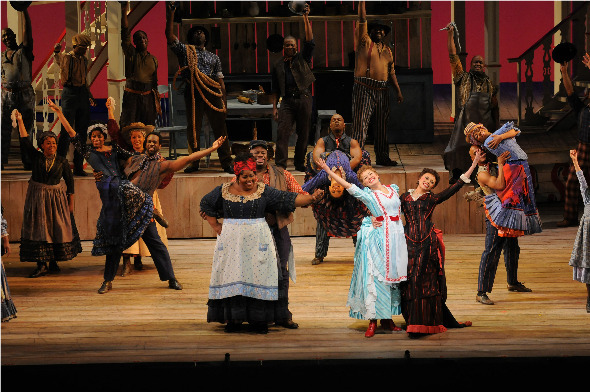 “Show Boat” also changed the definition of the staged musical, which previously was little more than a series of light-hearted songs and dances linked by a loose story line. What Kern and Hammerstein devised was a solid play elaborated through musical components, something more like operetta. 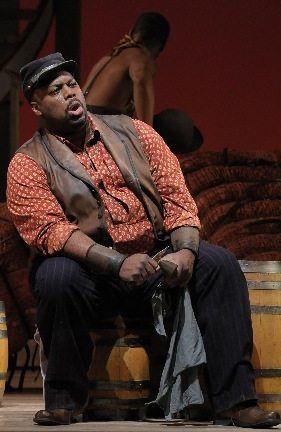 It is no stretch to see this musical as the antecedent of “Porgy and Bess,” by George and Ira Gershwin and DuBose Heyward, which opened just eight years later. Brown is also irresistible as the starry-eyed would-be actress who knows everyone’s lines in the show boat’s stock melodrama. Gunn cuts a dashing gambler, and every song he sings is another show highlight. What girl’s heart wouldn’t succumb to Gunn’s seductive “Make Believe”? Another of the show’s most enduring hits, “Can’t Help Lovin’ dat Man,” throws the spotlight on the two of this production’s most endearing performers: Angela Renee Simpson as Joe’s long suffering wife Queenie and Alyson Cambridge as Julie, the show boat’s star whose mixed blood precipitates her tragic descent. In the broken, boozy Julie’s “Bill,” a song of heart-stopping sadness, Cambridge takes this enterprise to its peak moment. But there’s an unending stream of terrific moments. In the speaking role of Capt. Andy Hawks, Ross Lehman adds polished comedy that tops out in a rapid-fire, one-man stand-in for several characters when the ending of a play goes haywire. As the song-and-dance duo Frank and Ellie, Bernie Yvon and Ericka Mac brighten scene after scene. And the Lyric Opera Chorus – augmented by a fine group of dancers – turns productions numbers into community celebrations. 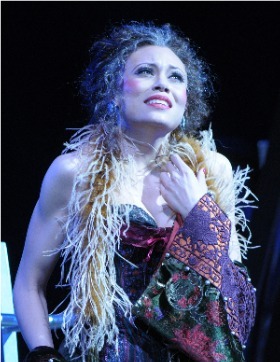 Not enough can be said for the collaborative work of conductor John DeMain, who weaves the show’s vivid episodes into whole musical cloth, and director Francesca Zambello, whose strikes a perfect balance between calculated pacing and free-wheeling energy. Peter J. Davison’s eye popping red-and-white show boat set is splendidly complemented by Paul Tazewell’s smart costumes. This is what the American musical should look, sound and feel like. No need to make believe.